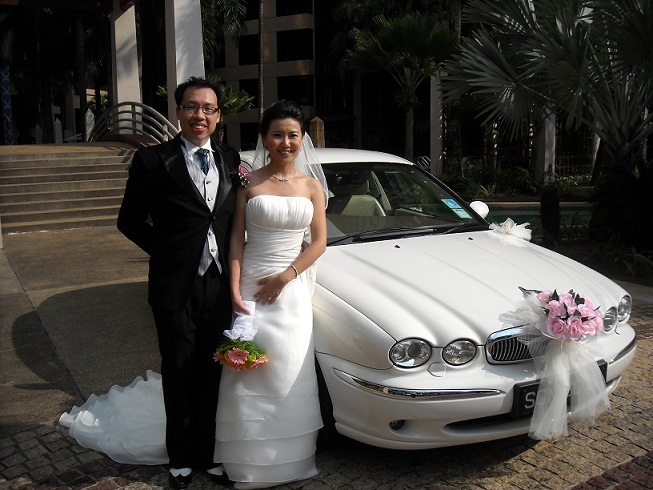 Rent Bridal Car: Congratulation to Chris and Rachel! Newly Wedded on 15 May 2011! Thanks for the great and friendly services! Very friendly, and flexible guy who is a punctual, trustworthy, smooth and safe driver. Does his homework on addresses and pro-actively reminds me when to do car decoration and such, really takes my mind off the car preparations so I can focus on other topics. The ride was excellent, spacious and comfortable, with nice selection of serene music to start the day proper! It is difficult to find a white Jaguar with vintage styling around now, and surprisingly easy to match car deco themes. We were adventurous and tried a new simplistic-modern-meets-classic art-deco look without the common huge ribbons/wisps and it turned out pretty well! Would definitely recommend to my friends and future couples!